Half-Jewish, comprised of Rob Rudin, Mark Chenevert, Danny Heath, Sam Dechenne, Gill Aharon, Paul Dilley, Mimi Rabson, and Ted Roland, is influenced by music from India and Turkey, Reggae, songs of revolution, salsa, jazz of all eras and, of course, Klezmer. The avant garde Jewish instrumental group Naftule’s Dream follows at 9:00 pm. The band started as a creative outlet for the members of the traditional klezmer band, Shirim Klezmer Orchestra. For more about the bands, see www.myspace.com/robrudin and www.naftulesdream.com. Beside being a warm performer with a gift of bringing people together, Alula has a riveting personal story to tell. He was born to a mother who was 12-13 years old. Alula did not know his mother since he was placed in a orphanage where he grew up until his father took him out with him to Addis Ababa. Alula was not aware of his Jewish roots until much later in life when he re-united with his mother. Alula taught himself music and started appearing early in life. He was so successful that the regime of Mengistu Haile Mariam wanted to recruit him as a tool of propaganda. Alula refused and was sent to jail for a year.At the age of twenty Alulas father sent him to Maximilian University in Munich, Germany, to study medicine. Alula studied for 3 ½ years but then received a recording contract. Upon completing his contract Alula moved to Los Angeles where he has been living ever since. 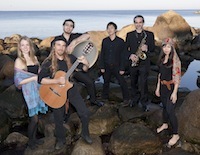 Alula will weave a musical yarn of world music and reggae connecting cultures, races, and faiths. with Alicia Svigals Violin, Mac Gollehon Trumpet, Trombone, Robert AaronTenor Saxophone, Flute,Evan Mazunik Keyboard, Vocals, Samson Kebede-Bass,Tyrone Govan  Drums, Percussion, Jemel Alston- Vocals. Des Juifs étaient vivaient déjà dans le midi de la France à l’époque romaine. Au 17ème siècle, ils furent regroupés dans quatre villes: Avignon, Carpentras, L'isle-sur-la-Sorgue et Cavaillon. Limités dans leurs droits et soumis aux violences populaires, ils bénéficiaient de la protection du Pape car la présence dans un monde chrétien d'un peuple juif misérable était la preuve de sa culpabilité de déicide et de la véracité des enseignements de l'Église. Ces «Juifs du Pape» étaient ouverts aux influences musicales de leur pays: Leur liturgie fleure la fête champêtre et leurs chansons -en hébreu, en langue judéo-provençale ou “farcies”- sont imprégnées de la poésie des félibres. Mais l'Orient résonne aussi dans la mémoire de ces Juifs provençaux et on peut entendre l'oud ou le bendir derrière galoubets et tambourins! C'est grâce aux notations de Jules Salomon et de Mardochée Crémieux et à l'ensemble Nekouda que ces airs traditionnels nous reviennent, pour le plus grand plaisir de nos oreilles. Maoz's (Edom, 9 Volt, John Zorn's Abraxas) presents his wild trio, Crazy Slavic Band, at Modern composer and curator Guy Barash's new music series "Eavesdropping", as it returns to The Tank/ to present some of today's most daring performers and surprising composers. The border-crossing Lev-Yulzari duo explores folkloric materials from different traditions, in a personal approach that derives from various musical genres. 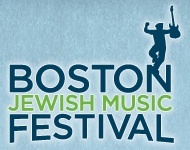 The program for this evening revolves around Jewish influences, including Sephardic music, klezmer and more. For artists, Eavesdropping provides a stage for risk-taking and the exploration of the non-conventional in sound, to present a relevant boundary-breaking artistic work. Shows often include multi-media elements, real time electronic processing, and performance art. For our audiences, we are committed to presenting innovative repertoire that is relevant and intriguing. Eavesdropping is cross-genres new music series presented to the city's inquisitive listener. The one that seen it all and heard it all but crave for cultural excitement. Tickets: $20 in advance, $25 at the door. Click here to purchase tickets. BJMF proudly presents two groups committed to interfaith cooperation, ethnic diversity, and the preservation of Jewish musical traditions. Tickets: $20 in advance, $25 at the door, students $15. Purchase tickets here. For your artistic inspiration, and maybe a little shopping, too, an Israeli art show and sale taking place at the temple will remain open that evening. Klezmer. Scottish. Jazz. Latin. Chamber Music. Funk. What do these genres have in common? Find out when Ezekiel's Wheels Klezmer Band and progressive Scottish band Alba's Edge join forces for an evening of traditional music as you've never heard it before. The show takes place at 8:00pm on Sunday June 1st at Club Passim in Harvard Square. Tickets are $15 (members $13).